For decades, both large and small companies have depended on brochures as a way to promote their businesses. Brochures are folded documents that give companies a concise way to share information and encourage people to buy their products and services. Brochures serve many purposes. In some cases they provide just enough details about your business or organization to make the recipient want to call and request more information. Your brochure can also provide all of the details that make a prospect want to make a purchase. Some companies use brochures to build their brands. The small size of brochures makes them ideal for distributing in stores, at networking events or at trade shows. You can also ask others, such as non-competing businesses and tourism offices, to hand out your brochures at their work sites, increasing your exposure to new prospects. A traditional brochure is printed on an 8.5” x 11” piece of heavy paper that’s folded into three panels, though some brochures measure 8.5” x 14” in size. More creative brochures may include slits for holding a business card, a pocket to hold extra information or additional panels that fold down along the top of the piece. While there is no limit on the size or shape of your brochure, if you plan to mail the pieces or load them in a brochure rack, it is best to use a standard size for easy mailing or placement. Use colors that complement your logo and industry. For instance, if you offer baby shower party services, using pink and blue to highlight text or as a background color makes sense. Brochures can be printed on glossy or matte paper, depending on the look you want. For instance, an accounting firm may want matte paper to give a feeling of responsibility and trustworthiness, while an adventure tour company would more likely want a full color brochure on glossy paper that shows the fun and excitement it offers. While most brochures are printed on standard cover stock, you can choose paper that helps push your branding. For instance, if you design custom invitations, a heavyweight, textured paper may better make the point about what you create. A brochure needs to provide lots of information while at the same time featuring plenty of white space so it doesn’t look crowded or unreadable. 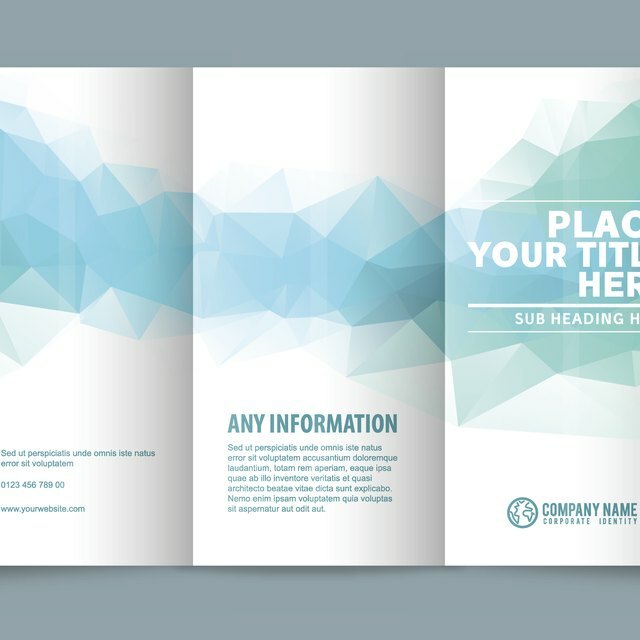 Include your company’s logo and full contact information on the front cover as well as on an inside page of the brochure. The back cover is a prime spot to share your company's history. Use the inside panels of the brochure to explain the problems your product or service solves, as well as the features and benefits. Sprinkle images on the inside of the brochure to help explain the content. You can also add photos of your staff, customers using the product or drawings that demonstrate what you sell. Add short testimonials on the inside panels or on the panel readers see when they first open the brochure. Savvy brochure designers know to avoid generic imagery that does not tell your company’s story. Headlines are a key component of a brochure, since readers may peruse the headings to decide whether or not to continue reading. Use headlines to briefly explain the problems your product solves and the benefits of using it. Under each headline, add copy that gives more detail. For instance, if your headline asks "Looking For the Perfect Gift For Dad?" follow up with copy that explains how your products or services make the ideal present. You might talk about how the uniqueness of your product will make it a memorable one for Dad.